You may not realize it, but the bedroom is the part of your home where you spend a lot of time in. Create the perfect relaxing ambiance and love your bedroom even more by upgrading these four items. As your bed is the heart of the room, using quality sheets and a full-size mattress can immediately elevate the look of the space. When you visit your favorite mattress store in Salt Lake City to purchase your new mattress, make sure to test out the different mattress types and get the biggest and thickest size that’s within your budget range. You’ll be surprised at how this changes the way you sleep. If you want premium comfort, get a memory foam topper; trust us, it changes everything! It’s ideal for getting the topper along with your new mattress so that you can test it out and make sure they’re both the same size. You can also test out the thickness of the topper and the matters and find the combination that works best for you. The right combination of softness and firmness is what sweet dreams and truly restful bedtimes are made of! Throw in some luxurious linens to complete the look of your 5-star bed. There are plenty of beddings made with sustainable, hypoallergenic material that feels soft and lush to the skin. Beddings made with high-quality materials actually feels so much more comfortable, so investing in them is an excellent way to complete your bed upgrade. Try some bamboo bed sets for a change. You’ll love the incredible softness and smoothness of these sheets, and its ability to regulate temperature so that you stay comfortable in your bed, no matter what the season is. Never underestimate the transformative power of the right length of curtains that fully covers your windows. 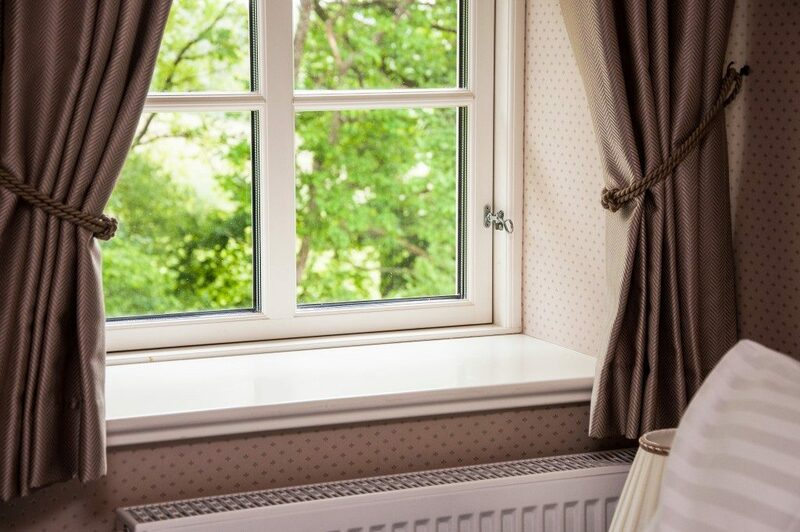 Create an elegant look using the right length of long curtains for your windows. The right length of the curtain would start about a couple of inches above your window frame and reach the floor with an excess of about an inch or two, creating a bottom that elegantly pools on the floor. Make sure the sides are covered well enough so that no part of the inside of your room can be seen from the outside. Aside from adding an elegant touch to your room, it’s also a great way to muffle sounds coming from outside and control the brightness in your room. To get that hotel room feel, use double layer curtains with the sheer panels at the back and the blackout panels at the front. This setup allows you to control the let as much light or as little light as you want, and even black it out if you need to do so. Nothing ruins a room design more than an awkward looking bulb that’s sticking out on the ceiling. Replacing it with a bedroom chandelier or putting a light cover on the existing bulb can dramatically improve the overall look of the room and creates a cleaner, more put together look. Soft white light is the perfect tone to create a relaxing ambience, which in turn triggers all those sleep hormones to work their magic and send you off to dreamland in no time. Switch to a soft white light tone for your lampshades, too, if you do some reading before hitting the sack. Soft light tones are best for rooms where you want to feel a relaxed and comfortable vibe. And your bedroom is the best place for it. Are you planning to remake your bedroom over the weekend? Use our list and add these items to your shopping list to make sure you’ve got everything covered. Have fun shopping and designing your room!